A third party authorization form is a document which is used by an individual to assign and formally acknowledge a third party representative to act on his behalf. The form is important to be presented by the representative before any type of transaction and request can be executed. Moreover, the representative should also be able to prove his identity by submitting supplemental forms that contain his name, details, as well as his relationship with the authorizing party. 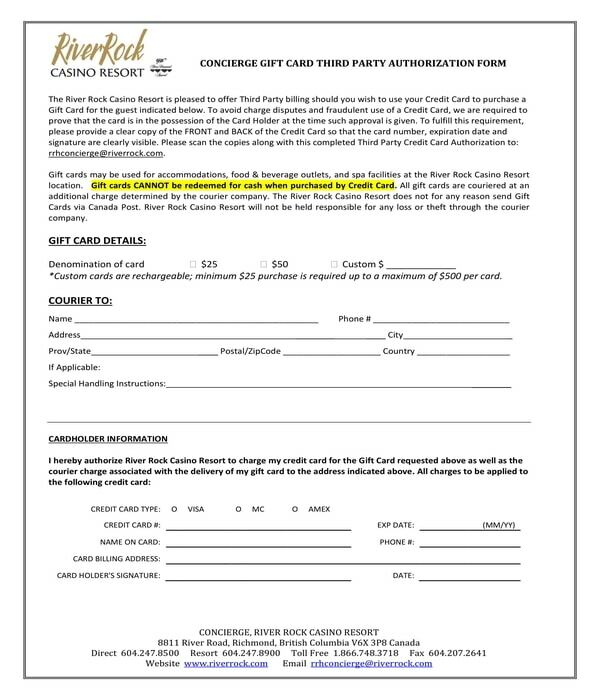 Gift Card Third Party Authorization Form – There are service providers and sellers who offer a third party billing option for their customers and clients when purchasing gift cards. For this, a gift card third party authorization form will have to be completed by the client. In the first section of the form, the details of the gift card will be stated such as the denomination of the card and its minimum rechargeable purchase amount. The second section will indicate the card recipient’s information which includes the recipient’s name and address, and the client’s special handling instructions to be followed by the delivery service provider or the courier. Lastly, the third section is where the client will disclose his card information such as the card type, number, billing address, and expiry date. Tenant Utility Charge Third Party Authorization Form – On a monthly basis, tenants will have to pay the bills which are defined in the lease agreement, including his utility and water bills. And to ensure that a tenant will be informed about any billing notice and reports, a landlord can require a tenant to assign a representative as the third party of the agreement. The tenant’s representative will be notified along with the tenant when the billing due dates are drawing nearer. 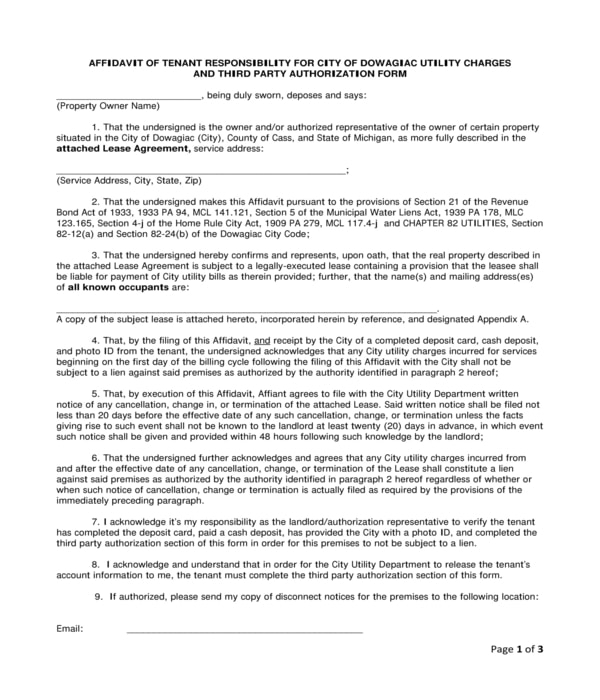 Specifically, a tenant utility charge third-party authorization form is the document to be required by the property owner for the tenant and his representative to sign. The purpose of the form is to enlist the responsibilities of the involved parties or the tenant and his representative, and indicate what notices are authorized to be sent to the representative in lieu of the financial obligations of the tenant. SIM Replacement Third Party Authorization Form – A subscriber identity module or a SIM card is an item which is placed inside a phone to store the data of a subscriber as well as his network, phone passwords, and contact lists. This card is an important piece that any subscriber must keep since it can contain confidential and private information about him, and the people whom he had on his list or have sent messages to. However, there will be situations where a SIM card, or the phone itself, will be lost or be stolen. This situation requires the subscriber to report the incident to the service provider for him to obtain a replacement. 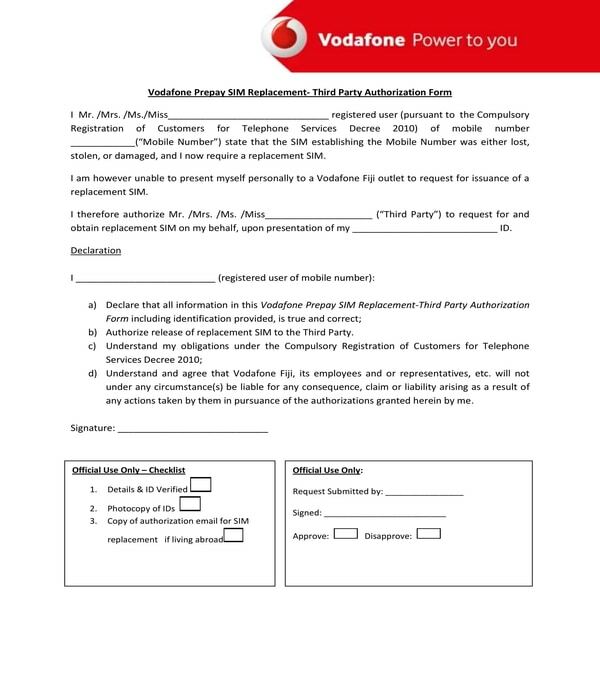 If the subscriber could not present himself to the service provider, a SIM replacement third party authorization form should be signed by him and the person whom he authorizes to acquire the replacement of his lost SIM card. 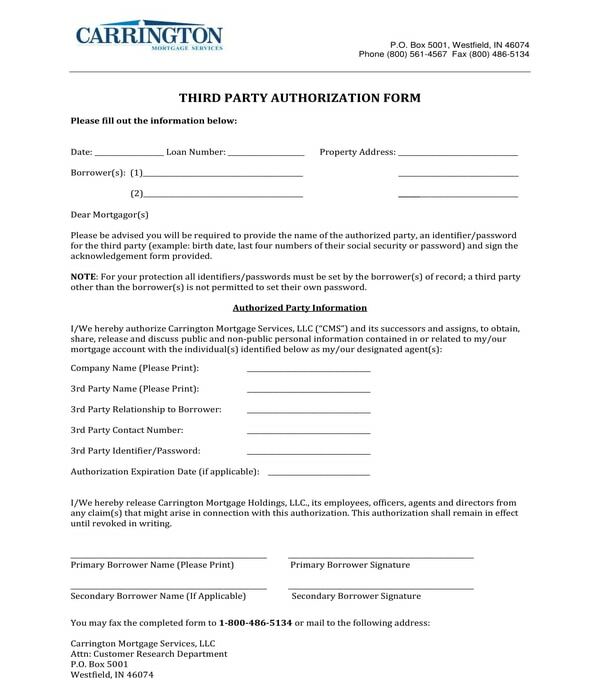 Third Party Authorization Payoff and Document Request Form – This form variety is preferably for mortgage loan borrowers who want their representatives to deliver the payoff amount rather than personally meeting with the mortgage company. There are four sections in this form. In the first section, the mortgage loan number and the names of the borrower and co-borrower will be stated along with the address of the mortgaged property. The second section, on the other hand, will be for documenting the basic data of the third party or the representative, while the last two sections are for the details of the payoff and the document request of the borrower. Third Party Authorization Release Form – Educational institutions also use third-party authorization forms for their students and faculty members. One of the most common documents used by schools is the third party authorization release form which is for students who will assign a representative to obtain his school reports and records. 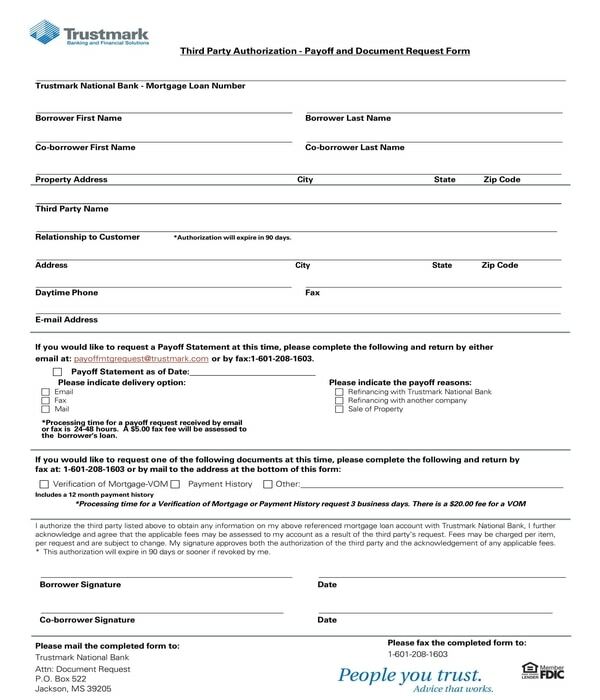 The form must be filled out by the student himself and be signed by him and his representative or the third party to be authorized. Some of the information to be disclosed in the form includes the student’s details, the name and the relationship of the third party to the student, and the description of the document to be picked up by the third party. 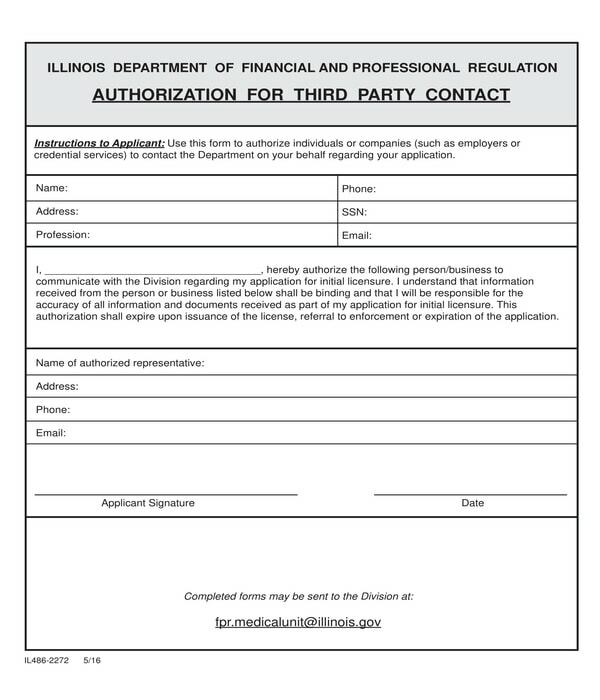 Third Party Contact Authorization Form – An individual who wants a licensure agency to contact his representative in lieu of his license application is the target user of a third party contact authorization form. The objective of this form variety is to permit the agency, and the authorized third party, to communicate to one another for updates addressed for the license applicant. In the form, the names and the contact information of the applicant and his authorized third party will be indicated along with the applicant’s signature. 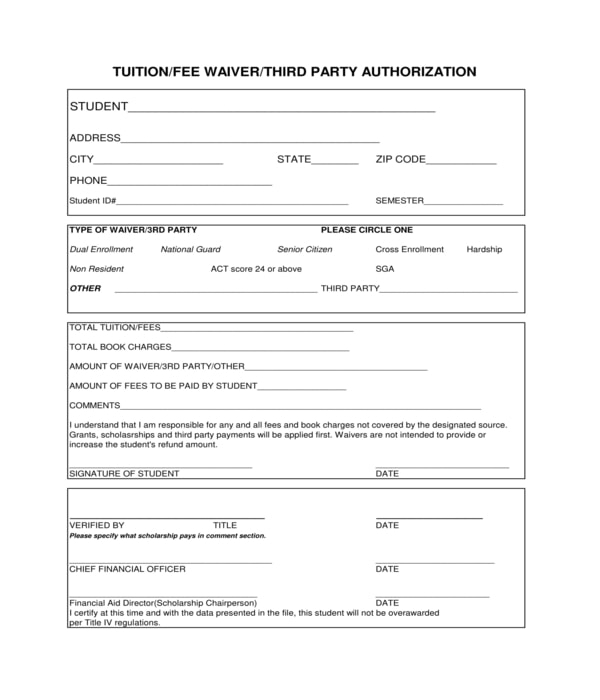 Tuition Fee Waiver Third Party Authorization Form – This is another form variety which is to be used by schools. Basically, a tuition fee waiver third party authorization form is for informing the school about a third party organization who will be paying for the student’s tuition fees. The form will have a student information section which will document the student’s name, identification card number, and the semester that the student has enrolled in. Two other sections in the form are allotted for the details of the tuition fee waiver and the amount of the fees to be paid by the third party and the student. What Is The Difference Between a Third Party Authorization Form to a Power of Attorney Form? Both a third party authorization form and a power of attorney form are for authorizing individuals to act on behalf of the authorizing party. However, these two documents differ on the range of the authority that the authorized party is given. With a power of attorney form, an authorized party will be referred in the document as the grantee of the power or the agent wherein he will be able to act, speak, and even make decisions for the grantor or the principal. On the other hand, a third party authorization form only permits the authorized party for a specific responsibility such as to receive and contact an agency to inquire and be notified about an activity where the authorizing party is involved in. Nevertheless, the two documents are important to be signed by all involved parties, and each item permitted by the authorized party must be explained fully to the representative. In addition, after the forms are completed, and after the completion of the representative’s task, the authorizing party must be informed about the progress of the task and further details about the request or inquiries of the third party or representative. 150+ Authorization Forms – Free Sample, Example, Format Download!